In 2013, we updated our web site, road-tripped to an NFL game together, crowned a new champion, helped a league member regroup after losing his house to a tornado, gave up the DBFA trophy earned in 2012, had children, moved out-of-state, toured Lambeau Field, got a new license plate, established our 2014 draft order, saw one of our own get promoted to First Sergeant, and lost two friends and brothers-in-arms: Brandon Landrum and Joseph Killman. Congratulations to Aaron Cobb, whose "Dogs of War" won their first OIL championship. The Harrington Trophy now resides in Fort Smith with Cobb, who was in Baghdad with the original OIL members in 2006 and joined the league in 2007. He defeated Cliburn, who tried and failed to be the first back-to-back champion in the OIL. Unfortunately, Cobb could not win the World War, so the OIL lost the DBFA's Trophy of Versailles. But the team Cobb had in week 17 wasn't the same one that dominated much of the season, though. By that time, Cobb was without Arian Foster, Wes Welker, Jermichael Finley, and Steve Smith. Still, he is happy just winning the OIL. Co-commissioner Adam Duffy claimed the number one seed but fell flat in the semifinals. And then Justin Finch beat him in the third-place game. Tough break. Bruesch's house after the May 20, 2013 tornado in Moore. 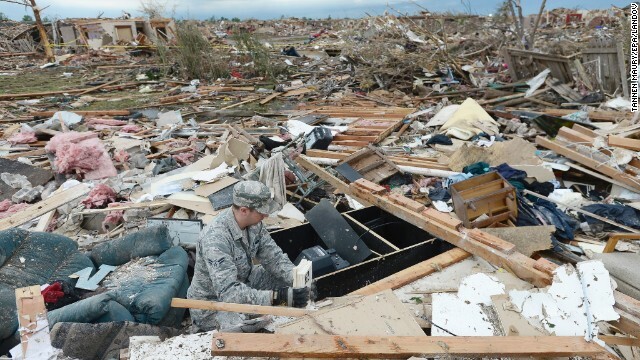 In May, two-time OIL champion Jack Bruesch lost his house in the Moore tornado that gained worldwide attention. Fortunately, he and his family were uninjured. OIL members and more came together to help in any way we could. He now lives in Norman and is grateful that his family is okay. On a lighter note, it is a good thing that Cliburn won the OIL and DBFA trophies back from Bruesch in 2012. Otherwise, those trophies would have been lost in the tornado rubble. Hat modeled after original Oklahoma state flag. The OIL site sold "Oklahoma Original" hats for tornado relief after the storms and raised money for the American Red Cross. The hats were modeled after the original Oklahoma state flag. Some hats are still available for purchase. In November, Yancy Baldwin, Justin Finch, Aaron Cobb, and Justin Cliburn went to the Cowboys-Vikings game together. It was the second straight year for an NFL trip among the guys, and they had a great time. Even sitting in the "nosebleed" section, the experience was fantastic. There really are no bad seats at "JerryWorld." Start thinking now about which game we should attend for our next NFL excursion. The Cowboys play the usual NFC East opponents at home next season, plus Arizona, San Francisco, Houston, Indianapolis, and New Orleans. Perhaps in future seasons we can expand our footprint and go to a different stadium, but Dallas is closest to most of the league. And the OIL family grew when 28.5% of the league had a baby in the last 53 weeks. Three league members' new babies were born in 2013 and one member had a son born just before 2013 began. Colt James Baldwin was born on Dec. 22, 2012. While his birth did not technically happen in 2013, it did occur between the 2012 and 2013 seasons. Colt just turned one and lives in Stratford with Yancy and his family. Jessen's daughter (left) was born in Duncan and has been sporting her favorite outfit since day one: her DominationStation onesie (it's unclear if Mrs. Jessen shares the love for fantasy football-themed infant clothing). Cali's quickly becoming Jessen's biggest fan. The other new additions to the OIL family were born far away from Oklahoma [insert your own opinion as to whether that is a good thing or a bad thing here]. Adam Duffy's daughter, Olive (left), was born in Packer Country, but her favorite team is the Hangovers. And Christopher Trovillo had his first child in 2013, a son. Robert Trovillo (right) was born in Volunteer territory, but he's a born Dirty Hippie. Congratulations are in order for all four fathers. Mrs. Commish chose not to visit Lambeau Field. Weirdo. 2013 was the first season Duffy spent in his new home. After living in Lawton-Fort Sill for 20+ years, Duff moved to his family's hometown in Wisconsin. The Commish and Mrs. Commish visited the Duffies' new home in July. The Commish, Duffy, and Duffy's father and brothers toured Lambeau Field and watched the Packers practice. It was the first time the Commish went to an NFL training camp. It also marked the first time that he had to wear a hoodie in July. Not cool, Wisconsin. Landrum deployed in 2008 with the 1-158. On a more somber note, 2013 was also the year that we buried friends and brothers-in-arms. 1LT Brandon Landrum died in May from an IED explosion in Afghanistan. Members of the OIL knew him as SPC Landrum. He was a medic and spent 2008 in Iraq with the 158. He went to the same high school and college as the commissioner and was active duty when he died. He trained with co-commissioner Adam Duffy at a "war fighter" exercise. He made us laugh at Camp Gruber. He'll be missed. Joseph "Jody" Killman, Baghdad, 2006. Joseph Killman died in December. He was in the 158 with all of us. He was in Jack Bruesch's and Cliburn's squad during the tour that gave birth to the OIL. He was funny, tough, and reliable. His death reminded us all how much we care about and miss each other. Even in death, Killman brought us together. At least 50 members of the 158, both past and present, attended his funeral. It was great seeing everyone that day, but the circumstances were awful. We shared stories about him and laughed and smiled. LT (now CPT) Ponder created a Facebook group for guys on that 1-158 SECFOR mission. Hopefully, we keep that group going and see each other again without someone dying. It's a shame we don't see each other more often. This league is how most of us keep in touch with each other. I hope that going forward we can organize more NFL game trips together and get more managers at our draft parties. We owe it to ourselves and to each other to stay in touch. Let's do that. Bruesch was a squad leader during the 2006 mission. Just before the new year, OklahomIraqi Jack Bruesch was promoted to First Sergeant. He was Cliburn's squad leader in Iraq in 2006. Congratulations to the two-time OIL champion, good guy, and great NCO. We're proud of him. In the last year, we also added names to our membership's waiting list. Adam Schuster remains at the top of that list. If someone should leave the league, he is next in line for OIL membership. He was in Iraq with the 158 during the 2006 season, and he spent 2008 in Iraq with the 158 as well. Check out our league store. Next in line is Stephen Brosh, who was Cliburn's roommate in Baghdad and who was also in Bruesch's squad that year. Nick Reed has thrown his hat in the ring as well. He was also on the 2006 mission with the original 10. They are all deserving candidates, but they'll have to wait their turn. As of right now, they're "on deck." After eight seasons, our league settings are pretty well-settled. But there is always room for improvement. Beginning in 2014, the OIL will re-seed its playoff teams after the first round. Our league has always said that we reward success. In that vein, the number one seed should play the lowest-seeded team in the semifinals no matter what. The number one seed in our league receives a first-round bye and now will also be guaranteed a matchup with the lowest-seeded team in the semifinals, giving that team the easiest road to the championship. Our league is special. I know that every fantasy football player thinks his or her league is the best, but ours really is different. You know why. Our league was born in Baghdad. It represents more than fake football. All 14 members of our league were in the Army. All but one served in the 1st Bn. 158 FA. Twelve of us were in Iraq together in 2006. The two that were not on that mission with us have been valuable members of the OIL. Few realize that Trovillo was responsible for creating the first OIL web site via the Weebly platform. That platform is still in use and has evolved to the site you see today. He was instrumental behind the scenes turning the OIL into a true community, and he has a great team name and logo too. Rogers is always involved, has one of the best team names and logos in the league, and maintains a fierce rivalry with Jessen. We have a website, a Twitter (@okiraqi), a Facebook group, a traveling trophy, a rivalry week, a league store, and a bond bigger than football. I enjoy serving as your commissioner, and I look forward to 2014. Happy new year, guys. Hopefully this year won't be nearly as eventful.